The RacersReunion® event that began in 2009 at Historic Columbia Speedway in Cayce, SC returns for the fourth consecutive year. 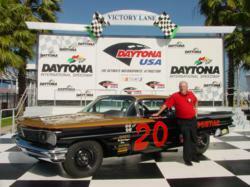 Grand Marshal and 1961 Daytona 500 champion, Marvin Panch returns April 6-7, 2012 to the track at which he competed during the heyday of his illustrious career. With a cruise-in, and old-fashioned drive-in movie, car show, vintage race car display, battle of the bands, and an autograph session with legendary race drivers, this event continues to grow. We're very excited about our fourth straight year at Historic Columbia Speedway," said Jeff Gilder RacersReunion® founder. "We have a great event planned this year!" The inaugural RacersReunion® at Columbia Speedway in April 2009 surprised everyone with a reported attendance of 30,000 plus. That event proved the significance of Columbia Speedway’s place in racing history and prompted track owners to preserve the facility for future events. Considerable upgrades have created a unique venue for a variety of events with the RacersReunion® returning annually to celebrate Historic Columbia Speedway’s contribution to racing history. Love Chevrolet has also returned for the fourth straight year as title sponsor. Event coordinators have spiced things up this year by adding an old-fashioned drive-in movie to the schedule of events. Friday, April 6th there will be a cruise-in at Maurce’s BBQ beginning at 5:00 PM. At 6:30 PM participants will proceed back to the speedway for some Carolina Beach Music and a showing of the movie, “Thunder in Carolina” on the facility's giant 40’ movie screen. Admission to the movie is $5.00 per car. This year’s event will again include the very popular RacersReunion® Family of Legends Autograph Session with racing legends attending from Virginia, Tennessee, North Carolina, South Carolina, Florida, and Georgia--all of whom raced at the storied track. Legendary driver and 1961 Daytona 500 champion, Marvin Panch will serve as the event’s grand marshal joining a cast of other legends (possibly 25 or more) such as Billy Scott, Dink Widenhouse, Rex White (1960 NASCAR GN Champion), Raymond Williams (aka Captain America), “Little” Bud Moore, Paul Lewis, Harold Fountain, Bruce Brantley, and “The Outlaw”, Peanut Turman. The Auto Fest portion of the event will include opportunities for owners of all types of classic cars, muscle cars, trucks, motorcycles, and vintage race cars to display their pride and joy. Participation in judging is optional. Anyone bringing a vehicle for show can attend the event free of charge unless they choose to pay the nominal judging fee. Car clubs of all types are encouraged to participate. The RacersReunion® Battle of the Bands competition has been added to this year’s event. Title sponsor Love Chevrolet has put up a $1000.00 purse in an effort to find the best band in the area. Winners will be determined by fan vote. Interested bands can apply at http://racersreunion.com/bands. Admission for the Saturday portion of the event is $5.00 for adults with children 8 and under admitted free. For more information visit the events calendar at http://racersreunion.com.